Open the can of frosting and add in a few drops of food coloring. Stir until smooth and frosting is medium yellow. Frost 3 cupcakes. 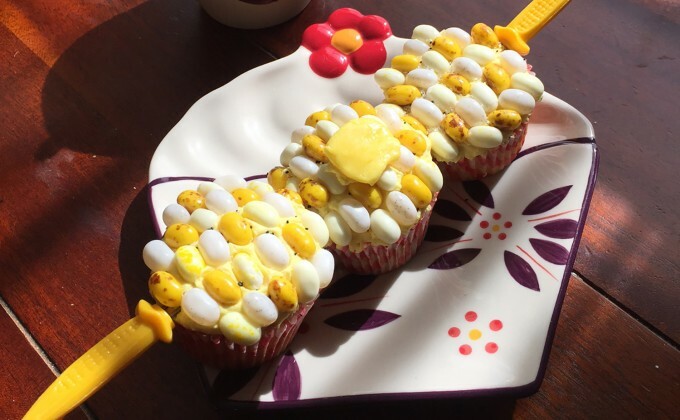 Lay 5 rows of assorted color jelly beans on top of cupcake to resemble corn kernels. Make sure you cover the entire top. Place the cupcakes together on a temp-tations® serving platter. Continue frosting the cupcakes in groups of 3. Unwrap and press each fruit chew in your palm, softening the edges to resemble the melting butter. Put a dab of frosting on the back of each one and place on top of the middle cupcake in each group of 3. Sprinkle the cupcakes with black and white sugar to resemble salt and pepper. Finally, insert one corn cob pick into the ends of each set of 3. Enjoy!